My impatience grew pretty heavy after I had ordered my first box of Topps 2010 Baseball so I got on over to Wal-Mart on Saturday for a little gift to myself. My purchase were two rack packs at $4.99/each. At 36 cards per pack they are a pretty good value at only $0.13 per card, about the same cost per card as a retail box from Dave and Adam's Card World though with a much lower hit rate than a hobby box/pack has. I didn't manage to get any million card codes, relics, autos, or parallels out of either pack (strange to me), but I did pull a good number of inserts. I'm not going to put pictures up for all the cards I pulled, but only highlight a few, so that the full review can be saved for the box break coming soon. 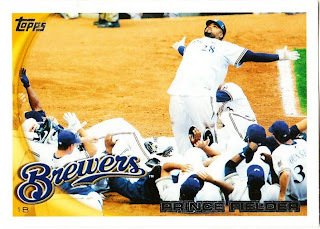 The obligatory #7 Mickey Mantle is gorgeous, the #117 David Dejesus is perplexing in how he's positioned himself, the #97 Luis Durango I like how he's reaching for the base, but we can't see it (though a horizontal card here may have provided a better overall image), and the #1 Prince Fielder is both hilarious and breath-taking at the same time (definitely a once in a lifetime sorta moment there). I like these cards as an insert, in theory, but I think that they should have stuck with only the non-original backs seeing as how I imagine plenty of people will buy the original-backs on ebay and get screwed. For opening two packs I'm over satisfied by the number I pulled (2 regs, 1 original back). The Gary Sheffield original back does have the 2010 copyright and isn't made of the same material that you'd find on the original so these are nice to have for those who can't afford copies of the originals, or wish to be able to handle them without worrying. The original backs are a 1:18 insert in the rack packs so I guess I got pretty lucky here. These cards are worthless to me, if you want the codes let me know, otherwise they're going on ebay. These cards have a good look to them, but this is a set that appears every year and shouldn't. I don't care about something that happened with Vlad in 2003; tell me the Peak Performances of the previous season. This set just outright bores me. Well designed but there's just something about it that irks me: perhaps its that I'm not too fond of attributing modern players so directly with the greats, especially when they've still got a career to screw up. Just like the Tales of the Game set, but with an artsier feel and more of an overarching story of baseball than the individual or team. This set is very well done, and also an interesting read. I don't understand what everyone's got against the Turkey Red inserts. They're nice to look at and give a deeper biography of the players we all love, or sometimes hate, and are much sturdier than the rest of the cards in most sets. Overall for the two 36 card packs I ended up with 58 base card with no duplicates and 14 inserts. Not too bad for a retail pack in my opinion. I do find it a little ridiculous that I pulled three Mantles out of just the two packs. But what's more ridiculous is that's not even 10% of the cards he has in the whole set, not counting parallels. I'm an Oklahoman so I love the guy, but couldn't we be filling in some of these spots with current players? More and deeper later this week when my first box of 2010 Topps arrives.